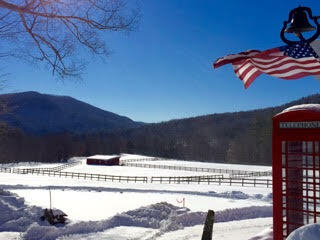 I recently visited the OQ Farm near Woodstock in rural Vermont. 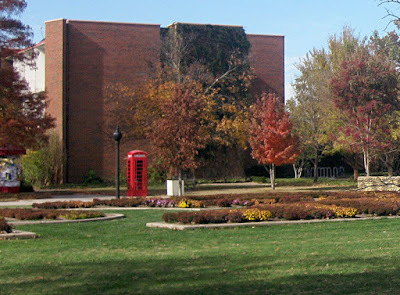 It is a retreat center which is connected to The Sword and Spoon Foundation, an ecumenical group interested in promoting a Christian culture of faith and beauty. The occasion was a gathering of Christian artists, musicians, and filmmakers, who gave talks about their work and shared ideas about the transformation of the culture. I was curious to see this place that is quietly become a hub for artistic renewal. If you look at the program of events over the summer, for example, there are two workshops by internationally known Russian iconographers, Anton and Ekaterina Daineko, who are coming from Russia to teach here. Also, the highly respected Catholic playwright and screenplay writer Buzz McClaughlin is offering a a workshop on story development. I first met Buzz about 10 years ago, and read his book on the structure of story narrative; I have kept in touch with him ever since, because his ideas regarding engagement with the culture, in the context of film, are in harmony with my own. The organizer of these events for the OQ Farm is Keri Wiederspahn, who is herself an accomplished icon painter and teacher in the Russian tradition. One evening while I was at this event, as the sun was going down, I took a walk around the property and a particular detail caught my eye, a red English telephone box sitting between the farmhouse and the barn. This was a nice coincidence, since the K2 telephone box was described in a book I had just read, Roger Scruton’s excellent How to Be A Conservative (a review of which will appear on this blog shortly). I asked about this and was told that it had been at the farm for some years, placed there by previous owners, but the current management had decided to keep it. Why would someone have gone to the trouble of importing a heavy chunk of painted steel at a cost of what must have run to thousands of dollars in the first place? 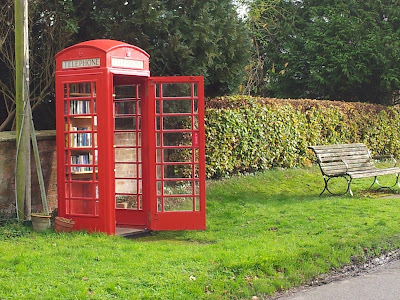 I suggest that the story of the K2 telephone box can explain why, in many ways a humble piece of street furniture could become an icon of what we are seeking in cultural renewal, and how, unlikely as it may seem, the liturgy is connected to this. 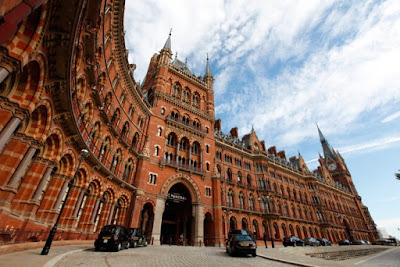 This begins with the Victorian Neo-Gothic movement in architecture, which had its roots in the mid-18th century, but became popular in the first part of the 19th with the rise of High Anglicanism and the legalization of Catholicism in Britain. One of the most influential figures during its rise in popularity was the Catholic convert, architect A.W. Pugin. 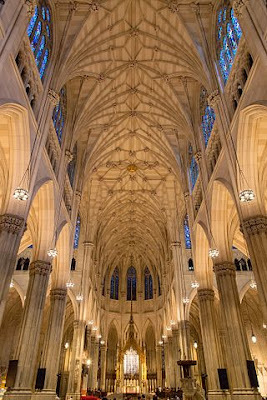 It has been said that “historically, all the great art movements began on the altar,” and this includes Neo-Gothic architecture. 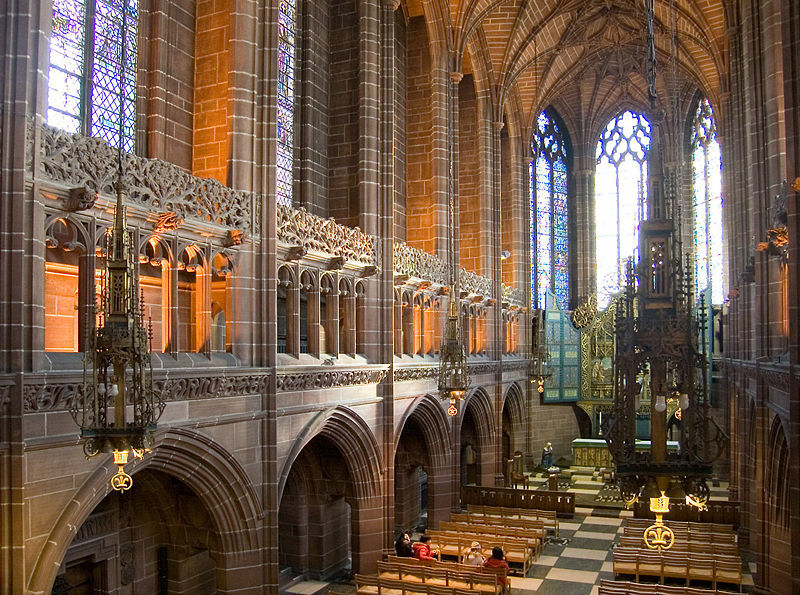 A style which began as the model for new churches then became a standard for civic buildings and homes in Victorian England. Many of these English architects were hired by Americans, and introduced the Neo-Gothic to cities int he United States. In the eastern part of the country in particular, there are many wonderful churches, colleges, and civic buildings in this style. 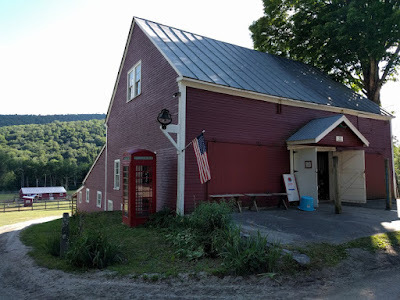 Some time ago, I featured on the NLM a small Neo-Gothic church in Maine, St Andrew’s, which was designed by the English architect Henry Vaughan. He was involved in the design of many grand churches in New England, and also one of the architects of the Episcopal Washington National Cathedral. 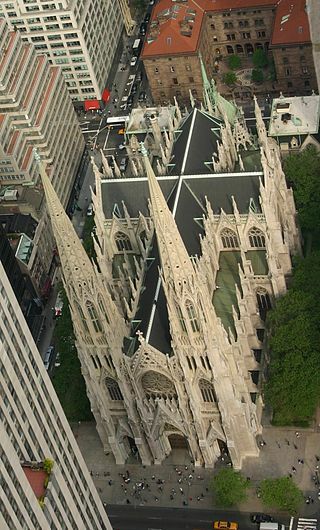 St Patrick’s Cathedral in Manhattan is another famous American Neo-Gothic church, built in the middle of the 19th century. With these liturgical buildings as their archetype, we see architects bringing the Neo-Gothic style out into the civic buildings of the city. As a result, their form is derived from, and points to, that which is connected to and in harmony with the liturgy. It was George’s son, Sir Giles Gilbert Scott, who designed the last completed Gothic church in England, Liverpool Anglican Cathedral. This was started in the early years of the 20th century and completed in 1978, when it was opened by the Queen. 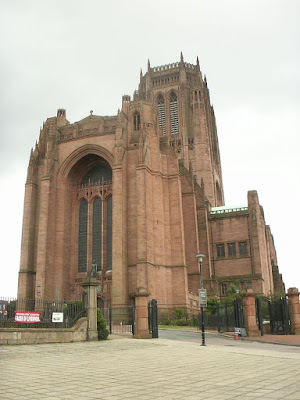 I was a schoolboy living about 10 miles from Liverpool at the time, and I can remember being awestruck when I visited it. We were told stories at school of stonemasons who had worked on this one building for their whole working lives, just as in medieval times. 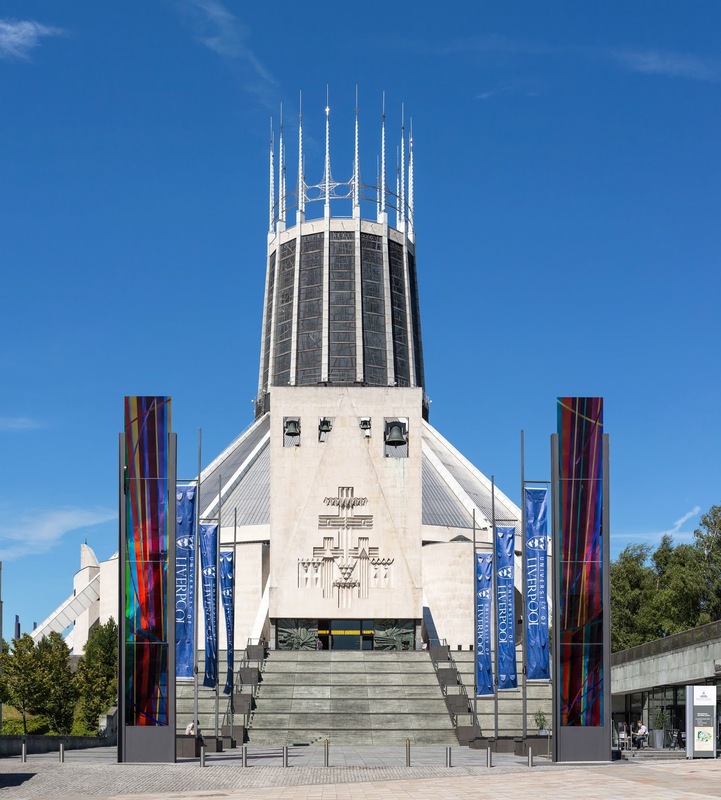 Contrast the above with Liverpool's Catholic Cathedral, started and finished in the 1960s. 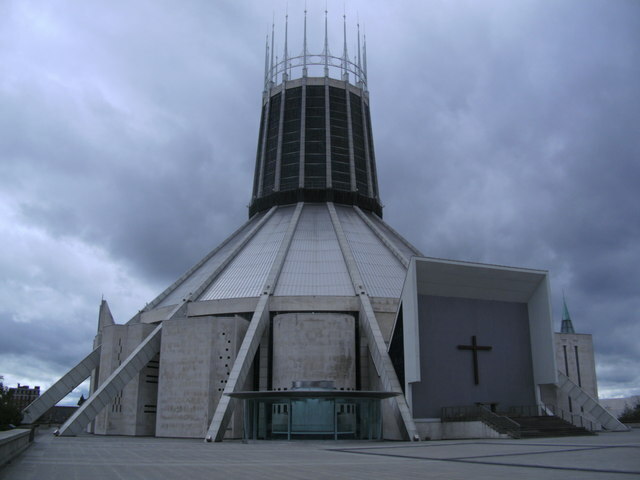 It is known by the locals as 'God's wigwam'. Moving on as quickly as we can from the concrete teepee, we can consider another civic building that is derived from the liturgical style, one of the most famous buildings in the UK. Westminster Palace, including the Houses of Parliament, was designed by Sir Charles Barry. The iconic Elizabeth Tower, as it was re-named in honour of our present Queen, which houses Big Ben, was designed by Pugin, who was working under Barry on the project. And now, in the foreground we see the familiar site of the red telephone box, looking at home in its urban surroundings. 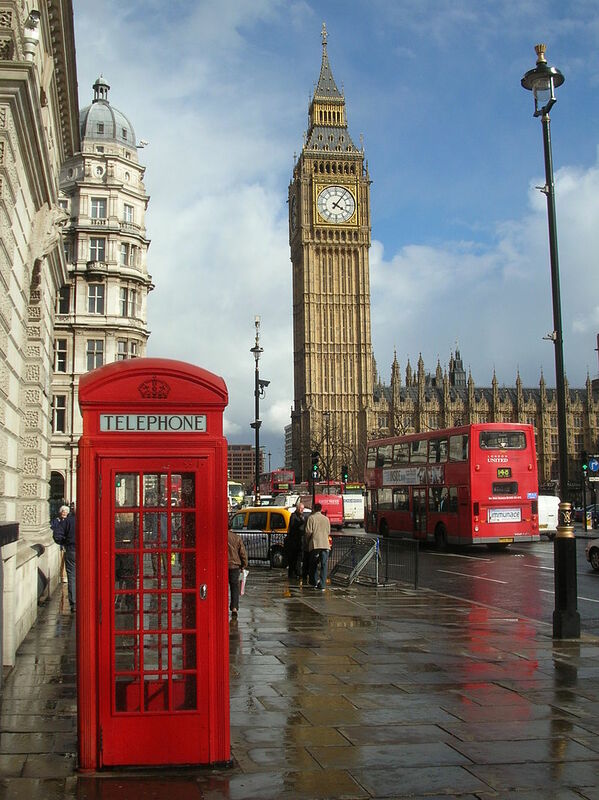 The telephone box was designed by the same man who designed Liverpool Anglican Cathedral, Sir Giles Gilbert Scott. Although this designer was steeped in Neo-Gothic architectural design, the inspiration for this came from the architecture of the 18th century Neo-Classical architect, Sir John Soane, whose in London house is a famous museum. At the time of the design competition for the K2 in the early 1920s, Giles Gilbert Scott was a trustee of the Soane museum; his telephone box is influenced by the mausoleum which Soane himself designed. 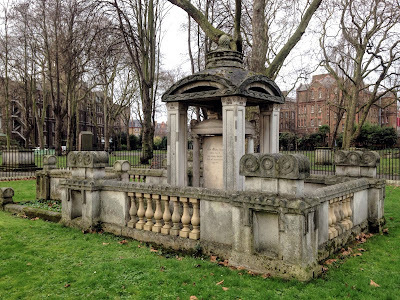 This is in the gardens of St Pancras Old Church, just around the corner from the railway station in London. Scott’s sense of proportion is influenced by his training as an architect. 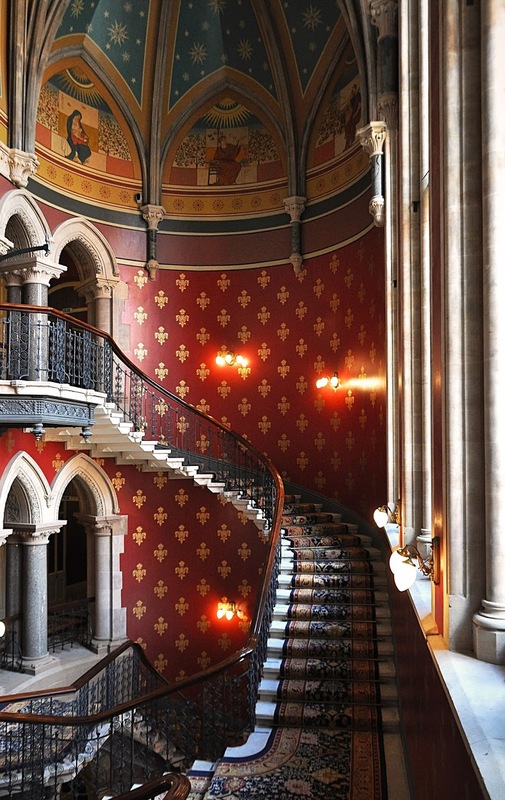 The basic proportional scheme is common to both styles, and broadly speaking, to all traditional Western architecture prior to about the Second World War, going back to the ancient Greeks. I think that it is interesting that one of the leading architects in the nation took the design of a piece of street furniture so seriously the he applied to it all the skill and experience that he might also employ in designing a cathedral, while realizing that one uses greater restraint and simplicity in designing a phone box than one would in designing a cathedral. The design of the phone box directs us intuitively to the liturgical architecture that traditionally the design of the civic buildings participates in, in all styles, not just the Neo-Gothic. Ideally, this crystallizes in exemplary fashion in the place of worship, which contains the heartbeat of the city. As the tabernacle and altar should be the focal points of the church design, so the cathedral should be the focal point of the city. The numerical source of traditional proportional schemes was originally derived in the pre-Christian classical world from the observation and analysis of the order of the cosmos, which it was believed gave rise to its beauty. These were adopted by Christian culture, and employed by architects as a matter of course until the period between the wars in the last century. 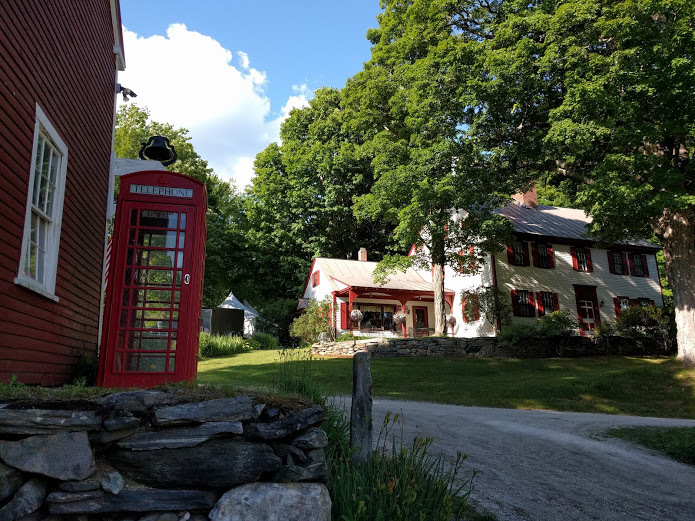 Because it conforms to this cosmic beauty, this little telephone box, like a village church, looks at home in the rural beauty of both an English village and a Vermont farm. 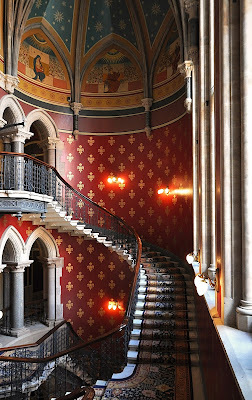 It is a simpler design than a cathedral, or a hotel, or even a farmhouse, but that is as it should be; after all, one of the attributes of beauty is due proportion - it is appropriate to its place in the hierarchy of human activity. While the ultimate expression of this beauty will ideally be in the place of worship, this is not the end, for the beauty of the cosmos and the beauty of the culture direct us to heavenly beauty, and ultimately, to the beauty of the Creator Himself, who left His mark on Creation and inspired the culture of beauty created by man. 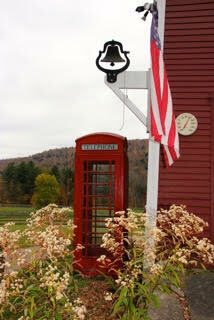 Here are some more pictures of phone boxes in English villages. They are so beloved that even in this age of mobile phones, when the need for them has long since past, people keep them as familiar and beautiful icons in the scenery. Sometimes they find an alternative use for them, such as a miniature lending library. This is the first photograph so far in which the box looks somewhat incongruous in its setting. The imposter in this scene is not the phone box, however. Rather, it is the featureless brick wall of a building, which dominates as a result of its size and aggressive ugliness. This is the building that dissents from a participation in cosmic beauty. You might ask why the box is K2, and not K1? The answer is that the K1 design was rejected by the phone company because they couldn’t persuade the London boroughs to allow it on their streets because of its ugly design. So they ran a competition for a new design which, they hoped, would be appealing enough to persuade the local governments to adopt this new, cutting edge technology. One wishes that today’s utility companies would go to similar lengths in the design of such things as electricity pylons or wind turbines! This is the reason why the OQ Farm is appropriate as an artistic retreat. 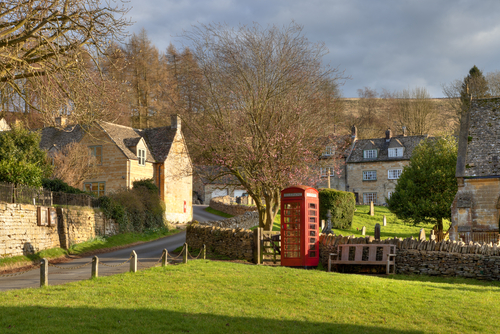 It’s the countryside, the buildings, and even the telephone box all speaking to us of the cosmic beauty, which in turn directs us to Beauty itself, giving us, as Benedict XVI puts it, an insight into the “mind of the Creator!” This is an inspiration for all hoping to create beauty for the greater glory of God!